The new model of ALV – SALV Model – also provides the interface for application developer to develop the Hierarchical list. This type of list are also known as the Sequential List. We use the hierarchical-sequential table to display simple hierarchical structures. In addition, exactly two hierarchy levels are available for the use: the header level and the position level. For each hierarchy level, we have to specify a table and also the key columns, like foreign keys. We can use the model by using the reference of the calss CL_SALV_HIERSEQ_TABLE. We can use this class instead of the function module REUSE_ALV_HIERSEQ_LIST_DISPLAY. Class CL_SALV_HIERSEQ_TABLE has a FACTORY method. We will call this method and ask for the object for the Hierarchical Table. 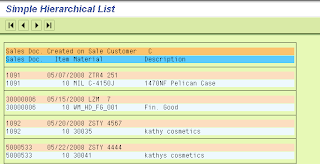 After getting the HS (Hierarchical – Sequential) Object, we will call the DISPLAY method to generate a list on the screen. Isn’t it sound too simple? Infact, it is simple. t_vbap TYPE STANDARD TABLE OF ty_vbap. DATA: o_hs_alv TYPE REF TO cl_salv_hierseq_table. lx_not_found  TYPE REF TO cx_salv_not_found. *     table. Based on this relationship, we will get the output. la_bind LIKE LINE OF lt_bind. Note: I had tried to build this report in the Object Oriented manner. You can check the UML diagram as below. This desgin will provide us the great flexibility to add more methods will set and get different properties of the O_HS_ALV object. For example, if want to add the expand & collapse button, we will add one private method SET_EXPAND_OPTION. We will implement this method by adding the relative code and call this method before the list display. In the code snippet, I have tried to differential three section which can be changed easily. In next blog posts, I will use this program as the base program and provide the code snippet to add the new functionality. Like: Section of CODE_ADD_1 can be replaced with the code provided in the future blog post. c) I want to add features to OOALV for creating a record and editing the record for ZTABLE (CRUD capabilities) How this can be done ? But I am trying to overcome this restriction. B) If I will be able to get it point A working than OO ALV features can be mixed in the SALV model. Updated the blog with the link which shows a way to make SALV as editable and give us the object of the CL_GUI_ALV_GRID to work with its methods. congratulations.. keep up the good work..
Kindly let me know how to send the Hierarchy List to spool?